Save money and save the environment, have your broken television conveniently serviced in your home for a fraction of the cost. We have 23 years experience and can service all makes and models. Very knowledgeable and excellent customer service. I would recommend. In total it cost $216 to repair my 2007 Sharp TV. The repair was done quickly and professionally. Ive only had the TV back a couple of days but so far everything seems fine. My impression is that the owners of this business are reputable and do a good job. The service technician was very professional and can’t be held responsible for the length of time required to get the parts from head office in New Jersey to Ottawa. The television is working fine now. I would not hesitate to contact this repair company again. Fast Service & Free Warranty Work Through Haier. Repaired our TV in excellent time (less than a day) for a reasonable price. Super friendly and communicates great throughout the whole process. The service was excellent - the problem was diagnosed, parts ordered and the Tv was back in my home within a 24 hr. period. I was also pleased that the charges for the work done was quite fair. Thank you for a job well done! Excellent in home service. We called about our Samsung with no picture. We were given an estimate over the phone, same day. They showed up in the afternoon, same day that we called and repaired our TV. Highly recommend as not many companies do in home service and it is extremely difficult to move a 60 inch tv in a Kia. This is an excellent place to go for tv repairs. The service is superb. Excellent service and good pricing. On time and very efficient. Found the problem and fixed really quick. Received excellent service for repairing my TV and in a very timely fashion. Excellent follow-up afterwards to ensure that all is working well. The technician came to my home to fix my tv, was very knowable, did a great job, am very satisfied and I recommend them. Fast and friendly service. Liked that they came to my home to repair my tv. I would recommend them to my friends and family. I own a Samsung LCD. In 2013 it was three years old and starting to crap out. 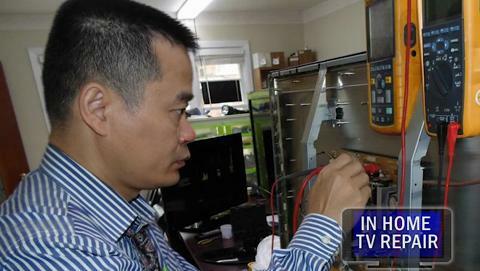 Hai replaced some parts in it and explained that the manufacturers typically use sub-standard parts knowing that the TV won’t last, and that most consumers will just buy a new one. I still have that TV he fixed in 2013 and only now is it starting to act up again. At this point, I think the TV has had a pretty good run and I’ll get a new one. All this to say, Hai is the man. Definitely the guy to call for TV issues. Even after the service call which proved that the issue with my big screen was trivial, Hai still reached out to Samsung to further investigate my issue and got back to me with days later with further details on the problem. He knows his stuff.